Raleigh was born on November 3,1918 in Knox County, Kentucky. His father was James Frank Helton, and his mother was Laura E. Engle. He also had a sister -Willis Willson Ren. He would receive an education at Grammar School level (an elementary school in modern terms) and was in the class of 1937 . He had a job as a sales clerk. On August 1, 1941 (before Pearl Harbor), Raleigh enlisted in the Army at Fort Benjamin Harrison Indiana. His serial number was 15063442. Raleigh was a part of was Infantry and had the rank of “Private First Class”. During his term of enlistment he would be part of the Hawaiian Department. On May 2, 1944 in New Guinea, Africa Raleigh B. Helton died of wounds. 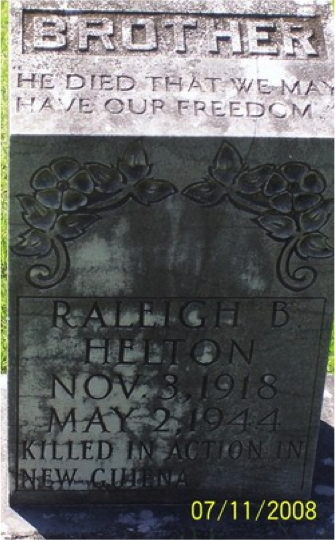 Raleigh B. Helton is now respectfully buried at Wilton, Knox County Kentucky in Campbell Cemetery.